Few organizations have been featured in more Hollywood movies over a longer period of time than the Texas Rangers. The “men in the white hats” first appeared in theaters in 1910 and continue to do so in the 21st century. 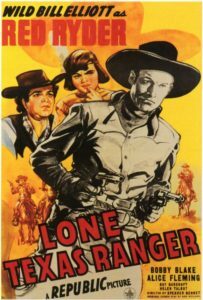 During 70+ of the last 100 years at least one movie was released featuring an actor as a Texas Ranger. 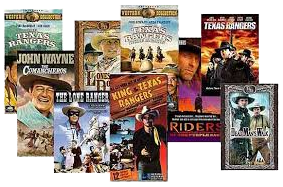 It may never be possible to present a complete list of Texas Ranger films because of the deterioration and destruction of early movies. The Film Foundation estimates that 80% of films made from 1897 to 1930 are now lost. Films listed below are feature-length movies, “shorts” (such as early movie serials) or stand-alone made-for-TV movies. Individual television appearances are listed with season and episode. These are fictional characters and do not include appearances in docu-drama, reality TV, interviews, etc. Detailed information about each film on the list below is available from the Internet Movie Database. Please e-mail us if you know of a film we have missed, and we will add it to the list. » 1943 was the high point of Texas Ranger themed movies with seventeen films incorporating Texas Ranger characters. » When Texas celebrated its Centennial in 1936, Hollywood responded with a movie featuring — the Texas Rangers. * Zane Grey’s Lone Star Ranger was made in 1919 and re-made in 1923, 1930 and 1942. * Grey’s Riders of the Purple Sage premiered in 1918 and was re-made in 1925, 1931, 1941 and 1996. * Grey’s Last of the Duanes premiered in 1919 and was re-made in 1924, 1930 and 1941. * Movies with the title of The Fighting Ranger were made in 1925, 1926, 1934 and 1948. » Actors who have played Texas Rangers over the last century include John Wayne, Clint Eastwood, Robert Duvall, Kevin Costner, Glen Campbell, Tom Mix, Dylan McDermott, Willie Nelson, Tex Ritter, Chuck Norris, Gene Autry, the Our Gang kids, Bill Elliott, George O’Brien, Roy Rogers, Clayton Moore, Audie Murphy, Nick Nolte, Tim McCoy, Tommy Lee Jones, Kelly McGillis, Richard Widmark, Sam Jones, William Holden, William Hurt, and many others. Please remember the Texas Ranger Hall of Fame and Museum in your charitable giving. About 70% of our annual budget and all improvements are funded through admissions, museum store purchases and donations. We receive no state of Texas or federal operating funding. Tax deductible donations may be made to: Texas Ranger Hall of Fame, P.O. Box 2570, Waco, TX 76702-2570.